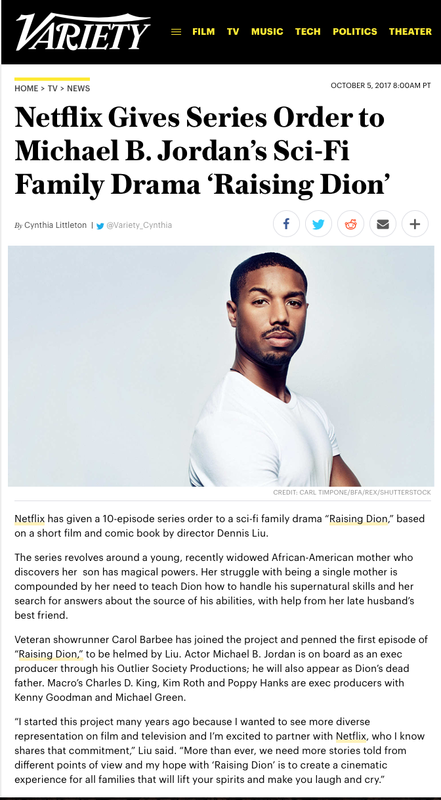 Netflix has given a 10-episode series order to a sci-fi family drama “Raising Dion,” based on a short film and comic book written by director Dennis Liu. The series revolves around a young, recently widowed African-American mother who discovers her son has magical powers. Her struggle with being a single mother is compounded by her need to teach Dion how to handle his supernatural skills and her search for answers about the source of his abilities, with help from her late husband’s best friend. Veteran showrunner Carol Barbee has joined the project and penned the first episode of “Raising Dion,” to be helmed by Liu. Actor Michael B. Jordan is on board as an exec producer through his Outlier Society Productions; he will also appear as Dion’s dead father. Macro’s Charles D. King, Kim Roth and Poppy Hanks are exec producers with Kenny Goodman and Michael Green. Cindy Holland, Netflix’s VP of original content, said she was intrigued by “Dion’s” real-world spin on a supernatural theme.